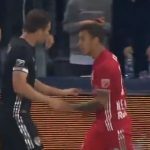 A New York Red Bulls player was ejected from the match in Kansas City on Sunday after kicking the ball point-blank in the stands and destroying the face of a fan. The team’s coach believes that the player was upset at an errant pass moments earlier and intended to kick the ball against the video board, but instead drilled a fan in the face, leaving him dazed and bloodied and in need of medical attention. He was only about 15 or 20 feet from the front row. The ball hit one fan, an adult male, squarely in the face. The fan appeared to suffer a bloody nose, though he did not leave the stadium for treatment. The 24-year-old Argentinian player will likely be slapped with a multiple game suspension.